We set up in 1999 when our first preschool Le Petit Jardin Sandymount began operation. At that time the school, housed in a warm and friendly home, had just 12 children. 18 years later Le Petit Jardin operates four childcare facilities serving the local and surrounding communities of Sandymount and Ringsend. Park Avenue Pre-School / Montessori runs two sessions daily Monday to Friday for children between 1.5 and 4 years and is located on the beautiful grounds of Railway Union Sports club. Le Petit Jardin Montessori School welcomes children between 3 and 5 years and is located a few hundred metres down the road in Sandymount village. We also offer free childcare places under the government ECCE Scheme. Tir na nOg Sportsco Montessori School is situated within the newly developed sports club on South Lotts Road in Ringsend. 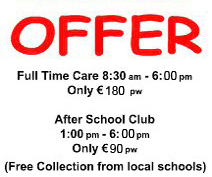 We’re currently running a special OFFER of only € 180 for full-time care 8:30 am – 6:00 pm and only € 90 for our After School Club from 1:00 pm – 6:00 pm with free collection from local schools only at Tir na nOg Sportsco, Ringsend. Tir na nOg @ Scoil Chaitriona runs the Admission’s Class/Montessori School where children can avail of our free ECCE scheme 9am to 12 noon. Our dedicated and creative staff provide a stimulating environment in which your child can grow successfully and happily. Our classrooms are designed to foster independence and nurture children in their self-discovery of the world around them. We assist your child in acquiring the social skills and self confidence needed to fulfill their potential. This is accomplished by building on interests, nurturing enthusiasm and making activities available to fit individual needs. Contact Mary Coyne on 087 911 4482 or by email tirnanog63@hotmail.com and we would be very happy answer any queries you might have, we can also arrange an appointment for you to view our school and secure your place on the scheme. Please download our registration form to enroll you child with Tir na nOg Childcare. Our bank details are at the end of the form. You can download the registration form including our bank details by clicking on the links below. Download the form in Excel format to complete it at your computer before printing it. If you have difficulties opening the form in Excel you can also download it as PDF. Please make sure that you fill out the form in BLOCK LETTERS.